Celebrating 20th Anniversary – Rooted In Indian Country during the largest gathering of Native Artists. Red Nation Film Festival is the Authentic Voice of American Indian & Indigenous Cinema and is the most prestigious trailblazing organization in NM. Los Angeles. Globally. August 18 to August 21 – before and during Indian Market Week. Sponsored by Red Nation Television Network, Jean Cocteau Cinema, Inn of the Mountain Gods, Buffalo Thunder Resort, Undisputed Fitness, Storm Studio, Plaza Cafe, LJS of Santa Fe, RainBow in Old Santa Fe, Food King. Media Support Santa Fe/Official Travel Site. Santa Fe Reporter. Tickets: Matinees: $8 adults, $7 students and seniors, $6 children. Special Events Tickets Dates: August 18. August 19. August 20. YOU can purchase below! VIP Festival Passes GET it ALL with your VIP Pass. 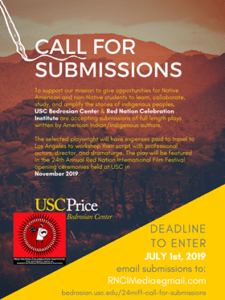 Supports Red Nation Celebration Institute Programs for Native Youth Matter, Native Women in Film & Television and other RNCI Initiatives. 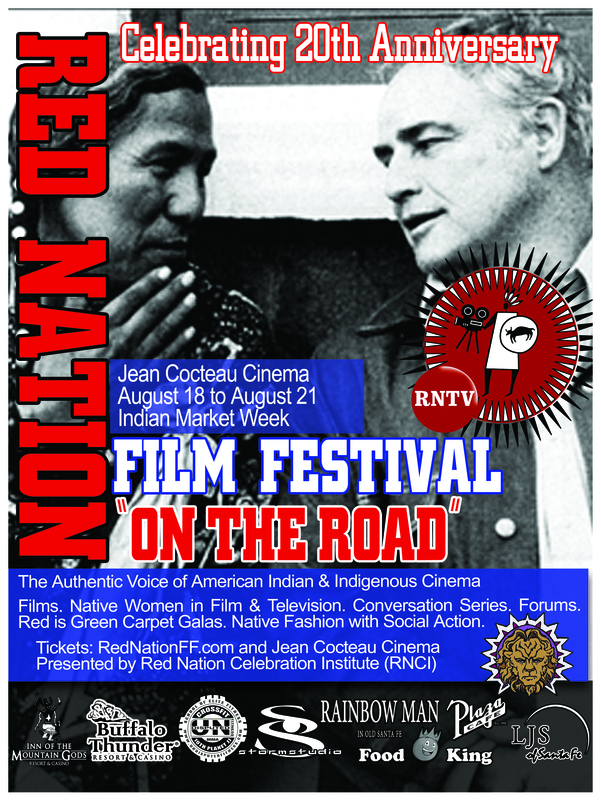 In partnership with the Jean Cocteau Cinema, the 20th annual Red Nation Celebration Institute & Film Festival kicks off an almost week long film festival highlighting the contributions of Native films and filmmakers. 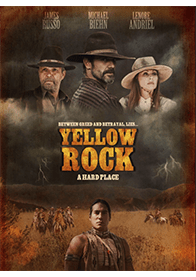 Attending Meets & Greet: Arthur RedCloud (The Revenant), Forrest Goodluck (The Revenant), Joanelle Romero (Pow Wow Highway), Jeremiah Bitsui (Breaking Bad) and many more …. This 90-minute documentary film introduces several of today’s leading Native actors, showcased and interviewed ahead of the 2016 Oscar ceremonies. Moderated by Joanelle Romero, Academy of Motion Picture Arts & Sciences & Founder of Red Nation Film Festival. Includes interviews with Forrest Goodluck of New Mexico and several other Native actors who appeared in THE REVENANT. Includes live Q & A afterwards with Native performers here in New Mexico. Following Screening: Red Nation Conversation Series Q & A with filmmakers and Special guests! 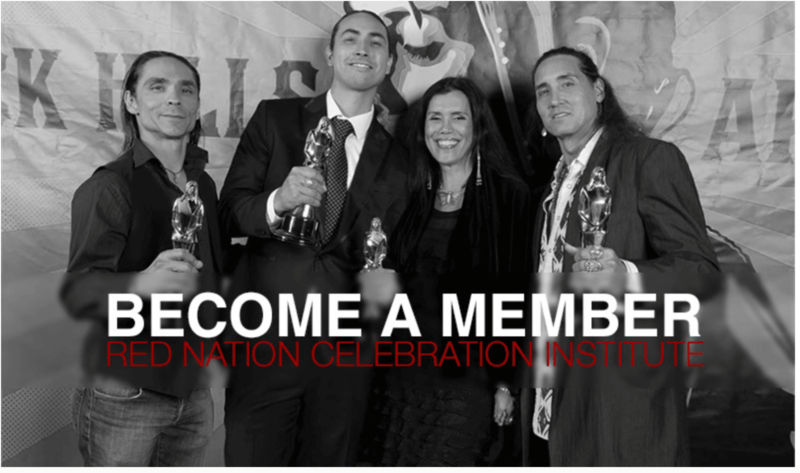 Event includes: Red is Green Carpet Gala arrivals 7:00 pm, in attendance donors, sponsors, artists, tribal leaders, and media will gather for a reception to celebrate the 20th Anniversary of the 2016 Red Nation Celebration Institute | Red Nation Film Festival. This reception will highlight native actors, artists, musicians, native filmmakers, dignitaries, galleries, and organizations which will include Film screening, Auction of Native Art, Native Fashion with Social Action, Music, Food, and special surprise appearances. NORTH MOUNTAIN and and the short Ay Jose! In the dead of winter, a young aboriginal hunter falls in love with a fugitive ex-con and helps him fight off an army of crooked cops seeking revenge. That’s the premise of NORTH MOUNTAIN, written and directed by Bretten Hannam, and starring Meredith MacNeill and Justin Rain. The feature film plays with the short AY JOSE!, Patricio Ovando’s tale of a 1950s love triangle, a criminal saga in which you know somebody has got to lose. Following the screening: Red Nation Conversation Series Q and A with the filmmakers and special guests. Meet Mabel Dodge Luhan, unique to her time. The Mabel Dodge Luhan Story, is a 1 hour biographical documentary that tells the story of Mabel’s personal evolution as a writer, salon hostess, art patroness, social activist and a resident of New Mexico. 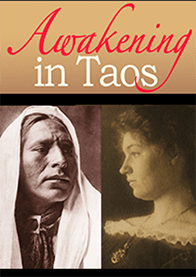 The production was produced in Santa Fe, New Mexico by Awakening In Taos, LLC in partnership with New Mexico PBS. Born in Buffalo, New York, Mabel was a woman unique to her time. Her influence extended into the world of arts, music, literature and activism for social change. In her late 30’s she experienced a life-altering arrival into a small town in Northern New Mexico and embraced the Taos Pueblo Indians in a way that seized the attention of the artistic and literary world. Plays with the shorts ODESSA and PRINCESS. 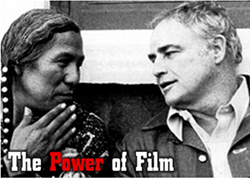 Following Screening: Red Nation Conversation Series Q & A with filmmakers and Special guests! Event includes: Red is Green Carpet Gala. 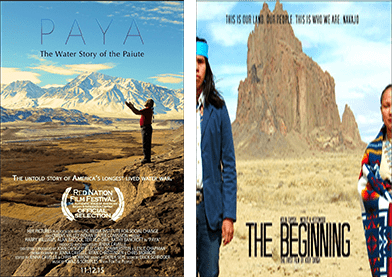 Here’s a pairing of two films — THE BEGINNING and PAYA: THE WATER STORY OF THE PAIUTE. THE BEGINNING is the premiere of a new short work by Navajo filmmaker Kody Dayish. The premise: An elderly Navajo explains to his grandson the ways of the Navajo tradition through a sacred prayer and song. He explains how Father Sky and Mother Earth give blessings to the Navajo to maintain balance of harmony. PAYA: THE WATER STORY OF THE PAIUTE is Jenna Cavelle’s documentary that explores the story surrounding America’s longest-lived water war and the Los Angeles Aqueduct. This was a Red Nation Film Festival winner for best short doc. Following Screening: Red Nation Conversation Series Q & A with filmmakers and Special guests! Event includes: Red is Green Carpet Gala arrivals 1:00 pm, in attendance donors, sponsors, artists, tribal leaders, and media to celebrate the 20th Anniversary of the 2016 Red Nation Celebration Institute | Red Nation Film Festival. Highlighting native actors, artists, musicians, native filmmakers, dignitaries, galleries, and organizations and special surprise appearances. Halee’s (Nezbahe Williams) is a young Dine poet. When her abusive father crosses a line, her best friend (Kayla Daily) helps her to run away. Their journey to Halee’s homeland takes a turn when she discovers her father has been hiding a secret that has the power to change Halee’s life forever. POWER LINES is written and directed by Klee Benally, who previously made THE SNOWBOWL EFFECT. In addition to making films, he tours with the Native rock group Blackfire. Following Screening: Red Nation Conversation Series Q & A with filmmakers and Special guests! Event includes: Red is Green Carpet Gala arrivals 4:00 pm; in attendance donors, sponsors, artists, tribal leaders, and media to celebrate the 20th Anniversary of the 2016 Red Nation Celebration Institute | Red Nation Film Festival. Highlighting native actors, artists, musicians, native filmmakers, dignitaries, galleries, and organizations and special surprise appearances. 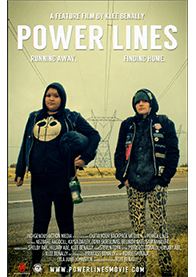 Native filmmakers, scholars and celebrity special guests join together in a discussion of how Hollywood connects or fails to connect with Native filmmaking. Besides the discussion, this event will include will include a film screening, auction of Native art, a Native fashion show, music, food, and special surprise appearances. Coordinated by Joanelle Romero from the Red Nation Film Festival. 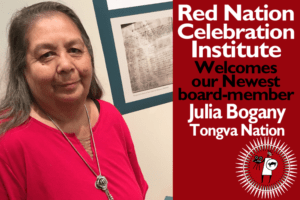 Panelists Include: Jeremiah Bitsui (Breaking Bad), Arthur RedCloud (The Revenant), Pearl Means (Russell Means Wife), Ryan Begay (Filmmaker/IAIA Alminui ), Joseph M Sanchez (Renown Artist), Joanelle Romero (American Holocaust: When Its All Over I’ll Still Be Indian) and many more …. Event includes: Red is Green Carpet Gala arrivals 6:30 pm; in attendance donors, sponsors, artists, tribal leaders, and media to celebrate the 20th Anniversary of the 2016 Red Nation Celebration Institute | Red Nation Film Festival. Highlighting native actors, artists, musicians, native filmmakers, dignitaries, galleries, and organizations and special surprise appearances. 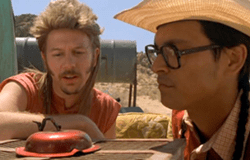 After being abandoned by his parents at the Grand Canyon, Joe Dirt tells the story of his journey to find his parents. This is one of the signature Saturday Night Live-spinoff comedies, co-written and starring David Spade. The 2001 film will be introduced by Adam Beach, who plays Spade’s friend and companion Kicking Wing. Beach will also field questions from the audience. This family-oriented film revolves around the conflict between a Lakota elder and storyteller named Pete Chasing Horse (August Schellenberg) and his Lakota grandson, Shane Chasing Horse (Eddie Spears). The plot unwinds as the two travel from Pine Ridge Indian Reservation in South Dakota to the fictitious All Nations powwow in Albuquerque, New Mexico, a trip the grandson takes only under duress. Along the way, the grandfather tells his grandson various Indian stories and legends to help him understand and choose the “good red road,” i.e., to embrace an Indian identity. 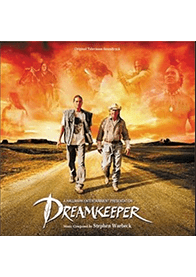 Directed by Steven Barron and written by John Fusco, the film also stars Sage Galesi, Gary Farmer and John Trudell. Event includes: Red Nation Conversation Series Q & A with filmmakers and Special guests. A man searching for his missing son hires a group of rugged cowboys to take him into territory controlled by the Black Paw Indians. When they come upon an ancient burial ground, their own greed tears them apart, as the posse turns on itself. This Western stars Michael Biehn and James Russo, as well as Native performers including Michael and Eddie Spears. It was the Red Nation feature film award winner for 2011. The Mabel Dodge Luhan Story, is a 1 hour biographical documentary that tells the story of Mabel’s personal evolution as a writer, salon hostess, art patroness, social activist and a resident of New Mexico. The production was produced in Santa Fe, New Mexico by Awakening In Taos, LLC in partnership with New Mexico PBS. Born in Buffalo, New York, Mabel was a woman unique to her time. Her influence extended into the world of arts, music, literature and activism for social change. In her late 30’s she experienced a life-altering arrival into a small town in Northern New Mexico and embraced the Taos Pueblo Indians in a way that seized the attention of the artistic and literary world. Plays with the shorts ODESSA and PRINCESS. Sponsored by Red Nation Television Network, Jean Cocteau Cinema, Inn of the Mountain Gods, Buffalo Thunder Resort, Undisputed Fitness. 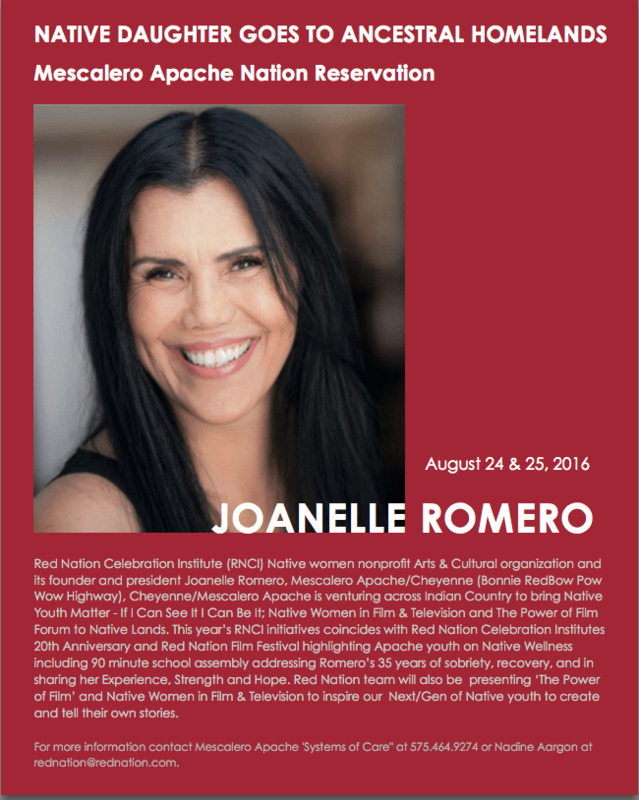 Initiative includes: Traveling to Mescalero Apache Nation to speak to Apache youth on addiction, recovery, and sobriety based on RNCI Founder Joanelle Romero’s 35 years of sobriety, she will be sharing her experience, Strength and hope. Her team will also be presenting ‘The Power of Film’ to inspire our youth to create and tell their own stories. They will also meet with tribal council in planning annual events for our youth, as well as Native Wellness programs. 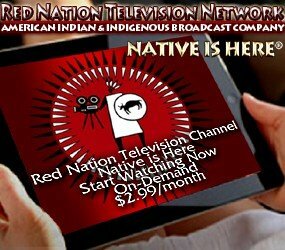 In addition, Red Nation Films will be producing, filming a feature Documentary on Native Youth and families. Red Nation Celebration Institute. Film Festival. Concert Series. Founded by Joanelle Romero 1995 in Santa Fe NM and supported by former Executive Director Don Owen of SWAIA, held annually during Indian Market. Red Nation Celebration Institute is inviting YOU to help support our community initiative. in Celebrating Red Nation Celebration Institute 20th Anniversary. Become a Special Friend with a $250 donation. Aheeiyeh, Thank you.